I've decided to award my own prize for the best Israeli film screened at the recent Jerusalem Film Festival. And the award goes to: Arnon Goldfinger's The Flat which is a triumph of personal documentary filmmaking. Goldfinger's grandparents, Gerda and Kurt Tuchler, lived in an apartment in Tel Aviv since they came to Palestine in the 1930s. 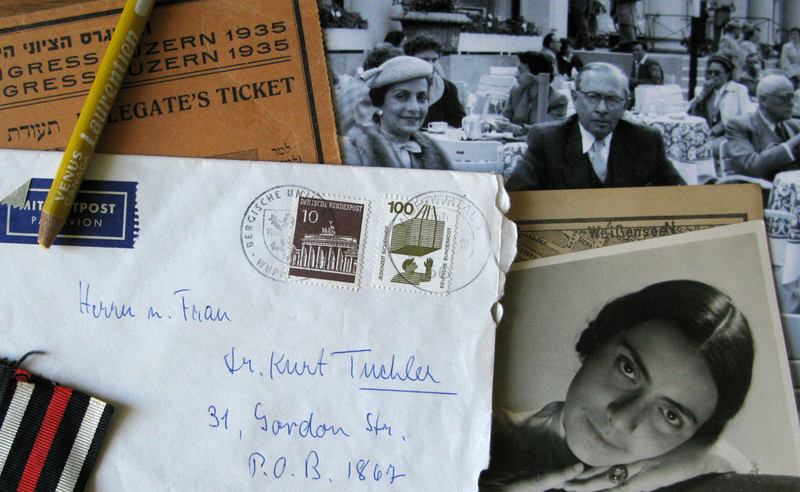 When Gerda passed away at the age of 98, her grandson comes equipped with a camera to document his family as they begin to unravel the contents of the apartment which was stuffed with classics of German literature, heavy European furniture, old carpets, photos, letters, ladies' handbags and dozens of pairs of gloves, old luggage, and more. Together with the filmmaker and his mother, we embark on a journey that begins in the closets of his grandparent's apartment in Tel Aviv and takes us to Germany to learn about his family history, exposing secrets from the past that are not so easy to deal with. At the Festival screening, Goldfinger talked about how the film, "which began as a little film about the clean-up of Grandma Gerda's flat", took over his life and took five "exhausting" years to complete. We follow his research, and like a mystery, a riveting story unravels before us. We learn about his grandparents, meet Gerda's closest friend, and look at photos and letters. Slowly a painful story unravels of a couple who remained tied to their roots in Germany, never fully became comfortable in Israel, and continued to return to Germany to visit with their German friends, even after the war. Why would German Jews renew their deep friendship with a German blue-blood, von Mildenstein, who was a member of the Nazi party already in the 1930s and a member of the S.S. during the war? The research takes us to Germany and we learn about Grandma Gerda's mother and meet the von Mildenstein family. Slowly we realize that this is not only an Israeli story but also a German story. We learn about the difficulties of the second and third generation in grappling with the past. Are they looking at it honestly or are they still hiding from the truth? The comparison with the second and third generation here in Israel is amazing. Grandma Gerda never talked about her mother to her own daughter, and her own daughter never asked how she died during the war. At the screening, Goldfinger explained, "I knew from the beginning that this had to be a co-production with a German company, with people of my generation." In the film, he goes to archives to learn more about von Mildenstein, who apparently was quite an important figure in Goebbels' ministry. Goldfinger meets with a German professor who is a specialist in Holocaust studies and asks him why his grandfather, who fled from Germany and raised a family in Israel, would re-establish his friendship with a Nazi friend after the war. The professor explains that, in order to help them confirm their German identity, there were Jews who, after the Holocaust, were unable to negate all of German culture and history and desperately needed to believe that there were some good Germans. This explained the complex identity of his grandparents. Even though they lived in Israel for most of their lives, they remained tied to their German roots forever. The filmmaker acknowledges having "rediscovered his mother" through making this film and dedicated his last comments to his grandmother and grandfather, expressing his hope that they would like the film, at least parts of it. "If not, please forgive me." The Flat won an award for best director of a documentary film at the Jerusalem Film Festival last week. The statement of the jury is as follows: "This is a beautifully composed film about uncomfortable truths and the challenge of confronting them. Mr. Goldfinger undertakes expert research and leads us through his findings in a way that is not only gentle and sensitive, but also compelling and creative." The Flat is available from First Hand Films and Ruth Diskin Films. The filmmaker, Arnon Goldfinger, is an accomplished documentary filmmaker, best known for his award-winning The Komediant (1999) which documents the story of Pesach Burstein and his wife, Lillian Lux, who together fled Poland in 1939 and were known as a legendary music-dance-comedy-theater team. Great summary of "The Flat." I just came back from seeing this at the Tribeca Film Festival. You're absolutely right - this is a German film as much an Israeli film. The supreme lack of curiosity by Arnon's mother and von Mildenstein's daughter (I forgot her name already!!) to reflect on their parents' past surprised me greatly. As Arnon finds out, there was an unwritten rule for that generation - parents did not talk about the war and children did not ask. The responsibility falls to the third generation, Arnon, who nevertheless had to wait 70 years until his grandmother passed away to tell this story. It makes me think - how many other hidden stories are there about Jews during the War, waiting to be told? I am looking for the name of the professor Goldfinger spoke with in “The Flat.”. Does anyone know? My grandfather, a German Jew in Chemnitz, was the only Jew left in town in March, 1945 (when he died in an Allied bombing). We are trying to solve the mystery of why he was never taken and all research points to a man who was my grandfather’s protégé as a prominent art collector during the 20s and early 30s. That man became a Nazi officer. After the war, he wrote to my uncle, saying that he was my grandfather’s protectorate. He died shortly after that letter was written. My father and uncle are also now gone. I am trying to verify this story and would like to communicate with the professor interviewed regarding unlikely Nazi-Jewish friendships in “The Flat.” Email is carolhsnider-at-Gmail. Thanks in advance for any help!